GRAND RAPIDS, MI â Thriving cities have solid roads and good schools, and those will always require money to build and maintain. Likewise, parks and bike paths are worth funding to make sure the quality of life of our region stays strong. Two proposals before Grand Rapids city leaders deserve both support from the community for the benefits they will offer, and discussion for their significant price tags. Grand Rapids City Commission on Tuesday, April 9, authorized submitting a state grant request to cover one third of the $836,000 cost of a planned 2.6-mile Lyon Street Bikeway. Local funds from an undetermined source would pay for the rest of the project. The plan calls for a 2-way bike lane along much of the north side of Lyon, adjacent to one-way motor traffic and parking on both sides of the street. Other sections of the bikeway would put bikes and motor vehicles in the same lanes. Grand Rapids has a growing, active cycling community and this will make it will be safer for them. The bike lanes also complement the growing emphasis on wellness. We hear a lot about walkable communities, we also want to be cycle-able. Later we learned about a $3.4 million proposal to overhaul Veterans Memorial Park and Monument Park, the city’s oldest. The sweeping plan, still in its early stages, calls for an oval-shaped commemorative walk with a new reflecting pool, seating, and arches. The building on the west side of the park would be redeveloped to provide restrooms and a coffee shop with outdoor seating. Money from that project would come in part from property taxes captured by the Downtown Development Authority and private funding; through the authority still is several steps from a campaign. Veterans Memorial Park is an unpolished jewel, especially with its proximity to the recently restored Civil War memorial. 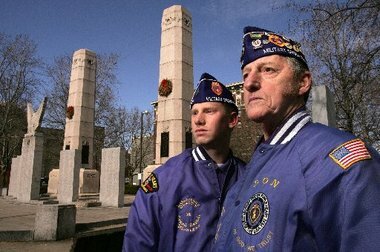 We’re proud of our veterans and support these historic efforts to honor them. Grand Rapids is a special place. We have wonderful museums, a world-class art competition and thriving institutions of higher education. We have a little too much winter this year, but, hey, some people like that, too. Critics will suggest other ways the money could be spent or say donât spend it at all. But city parks, walking and cycling trails and other investments made to enhance quality of life receive a lot of use from people of all ages and walks of life. Continuing the development at a sensible and affordable pace is reasonable.